Handmade in Nicaragua, Acid Krush Red Cameroon cigarillos are infused with a secret blend of herbs and botanicals to create an amazingly unique flavored cigar experience. Small in stature and flush in one-of-a-kind taste, Acid Krush cigarillos are sure to satisfy. 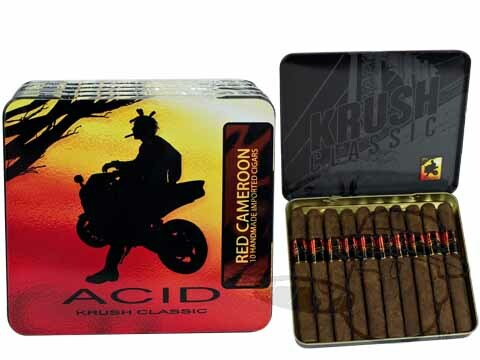 Acid Krush Red Cameroon doles out the dark and decadent flavors of Acid Red in a convenient 4x32 cigarillo. A nice quick smoke. A flavored stick with a bit less sweetness than the blue or yellow Acids. These babies come well packaged, keep them in the tin and in the wrap to keep their flavor. They are perfumed but no pretty, unlike anything else out there. They're strong and you'll like that, they're right THERE for you, nothing complex or subtle. Their size is small but the flavor is big. I found I like mixing things up in my big boys. Musicians call it "counterpoint". Enjoy. These cigars are great for when you don't have the time to sit down and enjoy a full grown cigar. They always have a good Camaroon flavor and nice creamy smoke. You won't be disappointed. Acid's Krush Red Cameroon cigarillos taste great. They're the perfect size to enjoy on a break when there isn't time for a full-size cigar. Acid Krush Red Cameroon is rated 4.2 out of 5 based on 14 customer ratings.